The Cippus Perusinus, a stone tablet bearing 46 lines of incised Etruscan text, one of the longest extant Etruscan inscriptions. 3rd or 2nd century BC. 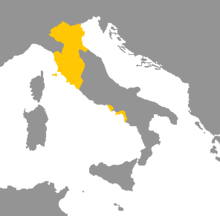 The Etruscan language was spoken and written by the Etruscan civilization in the ancient area of Etruria (modern Tuscany plus western Umbria and northern Latium) and in parts of Lombardy, Veneto, and Emilia-Romagna (where Gauls took the place of Etruscans), in Italy. Inscriptions have been found in north-west and west-central Italy, in the region that even now has a name that came from the Etruscans, Tuscany (from Latin tuscī "Etruscans"), as well as in today's Latium north of Rome, in today's Umbria west of the Tiber, around Capua in Campania and in the Po valley to the north of Etruria. This is probably the area in Italy where the language was once spoken. ↑ Hammarström, Harald; Forkel, Robert; Haspelmath, Martin, eds. (2017). "Etruscan". Glottolog 3.0. Jena, Germany: Max Planck Institute for the Science of Human History. This page was last changed on 12 August 2018, at 17:54.